Veteran drag racer Joe DeSantis, 66, of Rootstown, Ohio enjoyed one of the most meaningful seasons of his career in 2008. DeSantis achieved a long, sought-after goal by garnering his first ever sub-seven-second run with a 6.995 at the O’Reilly NHRA Midwest Nationals in early May. DeSantis’ first six second pass was in large part overshadowed by his opponent, Andrew Hines’ winning 6.87 on his Harley Davidson-backed V-Rod in the other lane. The 6.87 was the second quickest pass in the history of the class at the time. Despite the loss DeSantis still cherishes the run. DeSantis says joining the six-second club was even more meaningful than his first NHRA win, which came in a Roadster in the NHRA Modified Eliminator class at the Spring Nationals in the 70s. 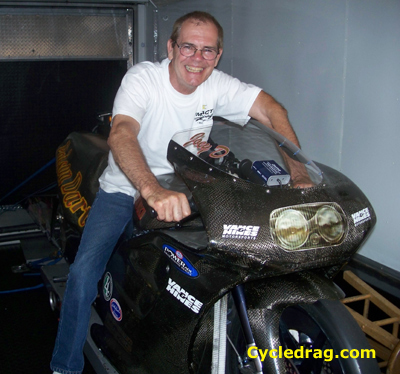 DeSantis has been involved with dragbike racing since the mid-80s. With such a long run history he has seen the Pro Stock Motorcycle class transform over the years. DeSantis says today’s dreadful economy and volatile fuel prices make being a racer more difficult than ever. DeSantis was able to attend nine events in 2008 to finish No. 17 in the highly competitive PowerAde Point Series. But in the end it’s not the points, personal records, or round wins that keep DeSantis going.